Toyota's new 1.3-liter engine, pictured, should get fuel economy gains of 15% over current vehicles, when paired with stop-start technology. TOKYO -- Toyota Motor Corp., which has lagged rivals in rolling out new engines, has unveiled two fresh powerplants that boost fuel economy by 10 percent and will underpin 14 new engine variants to be introduced globally through next year. The 1.3-liter, 4-cylinder and 1.0-liter, 3-cylinder gasoline engines achieve improved thermal efficiency through adapting a rapid combustion process, high compression ratio and an Atkinson burning cycle, which until now has been reserved for Toyota’s hybrid vehicles. The wide-ranging overhaul will use this base technology in bigger engines going into premium vehicles and hybrids, as well as engines using direct-injection and turbocharging. When the 14 new engines come to market over the next two years, they will cover about 30 percent of Toyota’s global nameplates. The deployment marks the first time Toyota will put an Atkinson cycle engine in a vehicle that isn’t a gasoline-electric one. The Atkinson cycle improves fuel efficiency keeping the intake valves open briefly during the compression stroke. The downside is reduced power. Toyota gets around that in its hybrids because it can augment the Atkinson engine’s lackluster horsepower with output from the battery-powered electric motor. The new approach aims to apply the Atkinson cycle from hybrid engines to non-hybrids while boosting power in other ways. “There is always the challenge of lower performance in torque,” said Shouji Adachi, project general manager of powertrain planning. “For the new engines, we were able to resolve these issues. The engines foreshadow the future direction of drivetrains under Toyota’s overhauled product development strategy. Dubbed Toyota New Global Architecture, or TNGA, the new approach aims to maximize common parts. The first TNGA cars are due in 2015. The engines are the first developed at Toyota’s new Powertrain Joint Development Building, a massive 12-story r&d center that opened last year at Toyota’s global headquarter in Toyota City. The center has a total floor space of 1 million square feet and allows stronger collaboration between powertrain, prototyping and production engineers by housing them all in one structure. Toyota’s more efficient power plants come as rivals such as Honda Motor Co. and Mazda Motor Corp. overhaul their own engine lineups to meet increasingly stringent fuel economy regulations. Honda’s line of Earth Dreams engines taps direct injection technology and turbo charging. Mazda’s updated Skyactiv engines pair fuel injection with ultra-high combustion ratios. 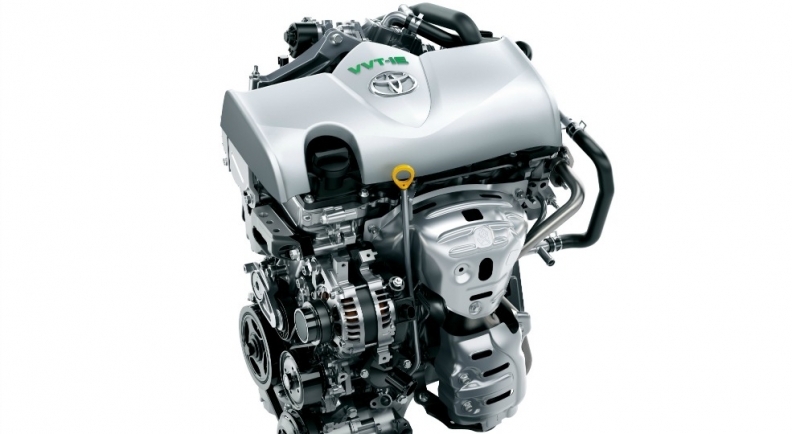 Toyota’s 1.3-liter and 1.0-liter engines will boost fuel economy by at least 10 percent compared to its current engines. But when paired with stop-start technology, which shuts the engine down at stoplights, vehicles with the 1.3-liter should get fuel economy gains of 15 percent over current vehicles. A stop-start equipped 1.0-liter car should get 30 percent better fuel economy than today’s comparable one, Toyota said. Toyota did not say what vehicles will get the engines, but the first two small-displacement power plants are expected to be deployed in non-hybrid compact cars for the Japanese market. Other engine variants using similar technology will also power non-hybrid vehicles, hybrids and larger premium vehicles. Toyota said 14 variants will be introduced globally by 2015. The 1.3-liter engine will achieve thermal efficiency rates of 38 percent, while the smaller one delivers 37 percent. Higher efficiency means more energy from internal combustion is captured to power the wheels and less is lost through heat. The outgoing engines have thermal efficiencies of 35 percent. The new efficiency rates are on par with the 38.5 percent ratio achieved in the current engine of the Prius hybrid. Toyota engineers have said they are targeting thermal efficiency rates above 40 percent for the next generation of hybrid engines. The 1.3-liter engine achieves a compression ratio of 13.5, while the 1.0-liter engine reaches 11.5. Both fall short of the 14.0 ratio delivered by Mazda, which is already targeting ratios of up to 18.0 in its next generation engines. Raising the combustion ratio is key to getting more power from the Atkinson cycle. But to counter knocking, an unwanted byproduct of high combustion, Toyota did three things. The new technology increases the combustion speed to consume more fuel before knocking can occur. It scavenges and expels unburned elements, so as not to overheat intake air. And it uses a water jacket around the cylinder to regulate heat. Another advancement is reduced friction inside the new engines. For example, engineers modified piston skirt surfaces, used plastic-coated bearings and deployed a low-friction chain. Toyota’s reliance on the Atkinson cycle departs from rivals turning to direct injection or downsized turbo-charging to reduce fuel consumption. But Adachi said the company would keep dabbling with those systems in tandem with its new technologies. The Lexus NX compact crossover that arrives this year is expected to get a 2.0-liter turbo, for example. The Toyota Crown Hybrid sedan recently received a direct fuel injection engine. But Toyota has less incentive to go the turbo route because it has invested heavily in electrified hybrid drivetrains as its answer to more demanding fuel economy requirements.